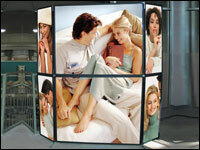 SIGNS-N-FRAMES originated the concept of the full-service sign store. And today, we are proud that all our locations offers a full spectrum of custom sign-making services that range from the simple to the sophisticated. 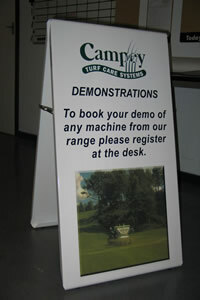 Below you will find some of the many products available from SIGNS-N-FRAMES. To see examples of these types of signs, click on any of the images below. Banners mean something special is happening. A sale, an event, a new store in town, all are usually made known through the use of banners. 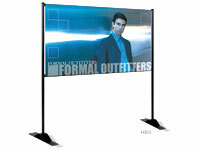 We sell banners in any size or color to meet your event and advertising needs! Add digital graphic to make your banner really stand out! No matter what kind of sign you need, there’s no match for the promotional value of full-color digital graphics – and no better place to get them than SIGNS-N-FRAMES. Digital graphics help bring awareness to for business. Just bring us your design, photo or message, and we’ll duplicate it according to your exact specifications. A-Frames are terrific for use in high traffic areas. They are an effective way to increase retail traffic. A-Frames are very portable and are often made from a variety of materials including wood, PVC, or various metals. We are excited about the latest technology in Vehicle Graphics. 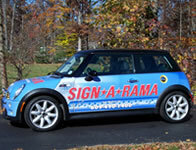 Such as with full color digital graphics which wrap around the entire vehicle. We can now put graphics along the full length of both box and semi trucks. This is incredible for both the end user and Signs-N-Frames. We can not install these type of graphics in 1/2 the time and 1/2 the cost. Spread the word to your friends and colleges. Please call or write if you have any questions. motion. Whether you need car graphics, van graphics, truck graphics, aircraft graphics, and boat lettering, our stores have what it takes to drive your message home. Adding full color to these graphics will increase your visibility and create impressions which is the name of the game. We recommend using full color such as pictures and company logos. This will help set yourself apart from you competition. Choose from any number of vehicle graphics options, including one-way view glass graphics, digital designs, or magnetic signs that can transfer from one vehicle to another. Where would businesses be without the signs that announce their presence on the street, storefront or window? SIGNS-N-FRAMES sign-making professionals are adept at creating everything from monument signs to dimensional signs – not to mention banners, A-frame signs, and window graphics. And should you need a sign that works day and night, consider calling upon us to create electrical or neon signs and channel letters. Choose from any number of high-visibility materials and get invaluable free consultation about the colors, sizes and typefaces that will work best for you. Whether you’re trying to design a trade show booth or comply with ADA requirements, SIGNS-N-FRAMES is your inside track to visible and effective indoor signage. Our stores’ indoor sign-making capabilities include engraved signs, ADA compliant directional sign systems, menu boards, point-of-purchase displays, directory signs and trade show booths and accessories. After all, when it comes to signage, sometimes it’s what’s inside that counts. From tradeshow displays to banner stands, when you are ready to market your company at tradeshows, conferences or meetings, come to SIGNS-N-FRAMES for the latest in exhibiting and marketing expertise. We have the displays, design and graphic capabilities to make you look your best! At prices you can afford. Fabricated three dimensional letters typically built from aluminum and lit with internal neon, fluorescent lamps or LED lighting. These letters may have an attached acrylic face hiding the neon. 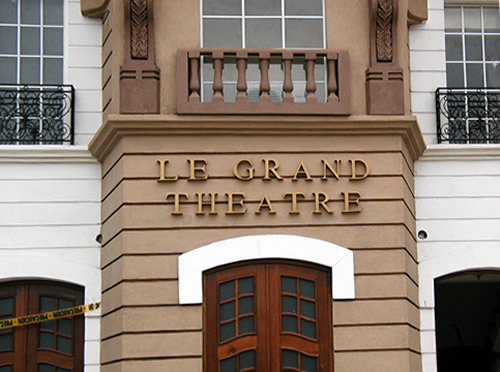 The acrylic face is usually attached to the sides of the fabricated letter using trim cap or edging. 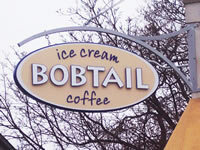 The letters are typical for storefront or interior or exterior signage. 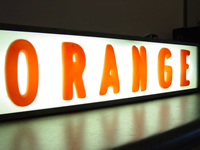 An illuminated sign box is an enclosed frame equipped with internal lighting. The frame holds the sign face on either one or two sides. Illuminated sign boxes are usually constructed of aluminum sheets that are bent, braced and welded, or constructed of aluminum extrusions, and are usually used as an exterior on-premise sign. Lightweight, moldable foam products have made these products more affordable, versatile and easy to install. 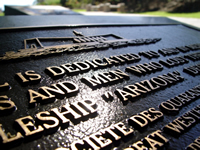 Many monuments are installed at entrances to business parks, residential developments and shopping plazas. Some monuments have illuminated signs installed in them to advertise products or prices. Many are elaborate concrete block construction with stucco finishes. Neon signs are illuminated signs bent in the shape of the sign’s message. 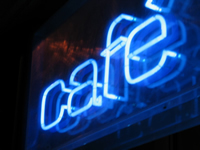 Neon signs utilize a hollow glass tube filled with gas. 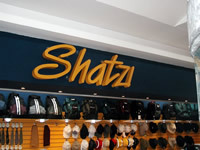 It is used for vibrant, high impact interior or exterior signage. 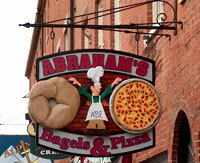 Wood signs, which can be considered one of the oldest styles of signage, still today proves to be a popular item. In some cities and some industrial as well as residential developments, wood signs are required. They have been used for everything from restaurants and boutiques to leather shops and ranches. Whatever the purpose, they continue to thrive. There are basically three ways of producing wood signs. They can either be hand carved, sand blasted, or routed. Engraved Signs are created by using one of two primary methods of engraving; rotary (spindle) engraved and laser engraved signs. 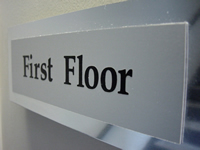 Commonly used for nameplates, desk plates, interior or exterior directional or way of finding signage. Some handicap directional signs can be produced with tactile and Braille messages. Individual letters are stand-alone logos, symbols, alphabetic or numeric characters. They can be cut, molded or fabricated from acrylic, foam, metal or wood. They are three dimensional and are mounted separately to interior or exterior surfaces. Real Estate Signs are typically screen-printed in large quantities, these signs are used primarily to promote the sale of a property or real estate. 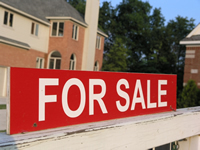 Most Real Estate Signs require the use of an iron frame or metal stake to support the sign. They are typically printed on aluminum or plastic.